The heavy cruiser Australia got hit more times by kamikaze aircraft in the Philippines than any other Allied warship. Japanese special (suicide) attack squadrons attacked Allied ships in the Philippines from October 1944 to January 1945, and H.M.A.S. (Her Majesty's Australian Ship) Australia was hit five times between January 5 and 9, 1945. Some sources claim that Australia also was damaged on October 21, 1945, in Leyte Gulf by a kamikaze aircraft in the first Japanese suicide attack on the Allied fleet, but Japanese sources do not support the claim that this was an attack by an organized suicide squadron. Australia, built in the United Kingdom due to financial considerations, served from 1928 to 1955. This ship history was published by the Naval Historical Society of Australia in a limited printing of 1,000 copies. The book's 34 chapters cover in chronological order the highlights of the 625,000 miles that Australia steamed during her service. About half of the book's pages describe Australia's participation in WWII, including the Battle of the Coral Sea, landings on Guadalcanal, the Battle of Leyte Gulf, and the invasion of Lingayen Gulf. After Australia's damage by five kamikaze aircraft hits over a period of five days ending with the invasion of Lingayen Gulf on January 9, 1945, the heavy cruiser never returned to the war with initial repairs carried out in Sydney and then a major refit in the United Kingdom. This book provides an encyclopedic history of H.M.A.S. Australia but does not include hardly any personal accounts other than a few short quotations. The recitation of many names of obscure places without any maps and the mention of numerous other ship names make reading a chore in most places. 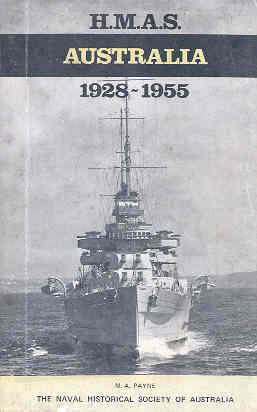 The inside front cover has an interesting sketch of this Kent class cruiser with four twin 8-inch guns and with a Walrus aircraft on a catapult, but the book does not give much background on the heavy cruiser's role in relation to other warships and does not present any information on the crew's life aboard ship. The book's center also contains 12 pages of historical photos. This Kamikaze had loaded himself up with a 15" or 16" shell from our own Naval Armament Depot at Singapore, and had fitted an impact fuse on the nose. It was annoying to say the least to be hit by one of our own bricks, and to be able to read the identification lettering in English on the base-plate of the shell. Despite the casualties and damage from the first two kamikaze hits, Australia kept on fighting. On January 8, the third kamikaze attack was a twin-engined Dinah that disintegrated when hit by Australia's guns, but a large piece of the incoming plane's engine hit the ship's side opening a hole about three feet square, but there were no casualties. Soon after another Dinah approached, flying ten feet above the water. The ship's guns hit the aircraft, but the explosion opened a hole about 14 feet by 12 feet right at the waterline. This fourth kamikaze hit significantly reduced Australia's speed, but luckily there were no casualties. The fifth and final kamikaze aircraft hit Australia on January 9 on the day of troop landings at Lingayen Gulf. The suicide plane only damaged the top of the foremost funnel and went over the side without causing any casualties. After hits from five kamikaze attacks, Australia was ordered to return south since she had several wounded on board and her battle efficiency had been considerably reduced. It was in fact the first Kamikaze "Heavenly Wind" sacrificial crashing on an Allied warship, although there were previous isolated deliberate crashing. It is not however a co-ordinated Kamikaze attack, these commenced four days later. Opinions vary regarding whether or not this was a kamikaze attack. Many sources refer to the attack on Australia on October 21, 1944, as the first kamikaze attack. Hoyt (1983, 65) states, "the first suicide diver had struck." The Australian War Memorial web site  gives the following entry for October 21, 1944: "HMAS Australia damaged by Kamikaze aircraft. The Japanese first used suicide attacks on warships in the Allied fleet supporting the American landings on Leyte in the Philippines." The Wikipedia article on the heavy cruiser Australia  explains, "On 21 October 1944, in the lead-up to the Battle of Leyte Gulf, Australia was hit by a Japanese plane carrying a 200-kilogram (440 lb) bomb, in the first-ever kamikaze attack." On October 21st, 1944 the Japanese army and navy air forces in the Philippines had only a limited number of aircraft to strike Allied shipping. HMAS Australia was the only large Allied ship damaged that day. These circumstances simplify identifying the attacker of a specific ship compared to the frenzied events of a few days later when hundreds of aircraft attacked dozens of ships. The post-war Japanese monograph covering these operations and the various books published since identify only one Japanese navy anti-shipping strike on the 21st. This is the Kuno Kamikaze mission which, due to timing and other factors, clearly was not the attack carried out on Australia. Lieutenant Junior Grade Kofu Kuno, the Navy's first Kamikaze Special Attack Corps member to not return from his suicide mission, did not take off on his final flight until 1625 on October 21, 1944 (Osuo 2005a, 158), but a Japanese aircraft crashed into Australia at 0605 on the same date (p. 145). The Japanese Army formed the first suicide squadron, the Banda Squadron, on October 21, 1944, but this took place on the Japanese mainland at Hokota Air Base, and the first Army suicide squadron members did not die until November 5, 1944 (Osuo 2005b, 8, 189). Dunn concludes that Army Type 99 assault bombers (Ki 51s) of the 6th Flying Brigade (FB) "were almost certainly Australia's attackers," and "it can be said with equal certainty that these attacks were not part of an official and organized policy of suicide attacks. . . . The aircraft that crashed into HMAS Australia on October 21st either did so by accident or was an example of 'Jibaku' a spontaneous suicide attack probably resulting from damage to the aircraft or injury to the pilot." O'Neill (1981, 127) comes to a similar conclusion in his 1981 book Suicide Squads. This ship history, which in places reads like the ship's log, probably holds little interest for the general reader. A few incidents such as the kamikaze attacks and the rescue of a crewman swept overboard (p. 4) offer some interesting reading but not enough to get through this history of more than 200 pages without some skimming.